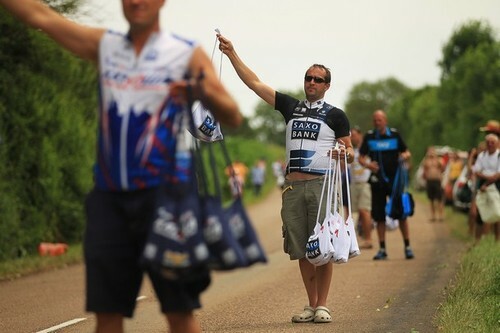 Unless you have raced or followed bicycle racing, you may have never heard of the Feedbag (Musette Bag). 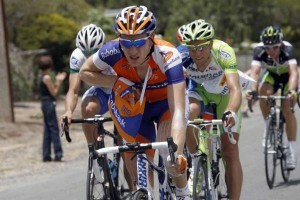 During the course of a long race (Road Race), the riders take on food as they pass though a designated area called the Feedzone. There may be more than one feed zone, based on the total distance the cyclists will cover during that stage of the race. The feed zone gives each rider an opportunity to take on food prepared by his team. Riders do not stop as they travel through the feed zone; they grab bags from team assistants that contain food, energy gels, extra water bottles, etc. Usually the feedbag is made with lightweight cotton, usually one button along the top opening and a thin strap so that the rider can wear it over their shoulder in order to retrieve the items from the bag without stopping their bikes. After retrieving the food items, the rider usually discards the bag along the road. 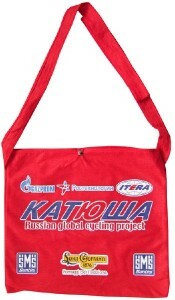 In every day riding, you normally never see this bag as riders just put food into their jersey pockets. It was never designed to carry heavy items for long periods of time. I’ve always thought that the feedbag was a great accessory for any cyclist to have. If you are likely to use your bike to run errands, the feedbag is great because it is lightweight and can carry considerable amount of stuff. 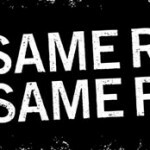 In addition, it can be a great accessory to use for sponsor giveaways at events. I had a Team Gan bag for awhile, I would use it for various things. I would ride my bike to meet someone and needed to bring them something, so I’d put on my kit and place the items in the feedbag and be on my way. I’d meet the person, give them their stuff then place the feedbag into my jersey pocket. I would go on training rides with the feedbag in my jersey pockets because after the ride, I planned on stopping by the bagel shop so needed the bag to carry the bagels home. The feedbag is a nice accessory, more versatile than a backpack, less bulky and cooler looking for a cyclist, more Pro. One of the biggest drawbacks of the typical feedbag for every day use is the material durability. Over time, the cotton begins to tear and the buttons separate from the material. The feed bag will not hold as much stuff as a backpack or messenger bag but the benefit the feedbag has over these types of bags is that it will not make you sweat on your back by sitting directly on the middle of your back as a lot of these other bags do. Only the strap crosses your back middle thus it will not restrict airflow across your back. The cotton bags are nice but the material is just not durable enough. With the thin straps, if you fill it with heavy items, the bag will sag badly and the straps will cut into your shoulders making it very uncomfortable. We starting thinking about developing a new type of Musette bag that would be made with material more durable than cotton, a zipper along the top, and a sturdier strap. We contemplated many different types of materials and decided that Windtex was the best material application. The material is durable, water-resistant, and will hold its shape very well. 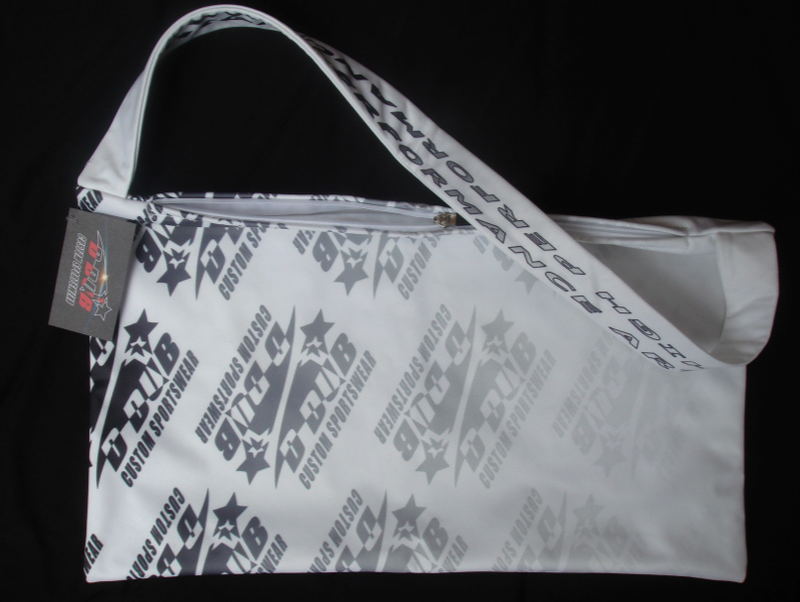 The D Dub Logo Urban Musette Bag is not designed to be a feed bag used during races, as it is really not a throw away item as traditional feedbags have been. Our musette bag is 20% larger than a typical feed bag in order to offer more storage space. We made the strap wider so that it would not fold over onto itself and dig into your shoulders. The straps are sturdy and soft. The full length zipper along the top is sturdy and easy to zip. The inside of the bag is lined with a soft fleece material, sensitive surfaces like cell phone screens will not be scratched if the phone moves around inside the bag. Although a little more bulky than a cotton bag, the bag will fold nicely into your jersey or jacket pocket, the zipper will keep items contained within the bag, and it is a great accessory to have when walking around cycling events or running errands on your bike. The musette bag is a great addition to your already existing cycling accessories repertoire.